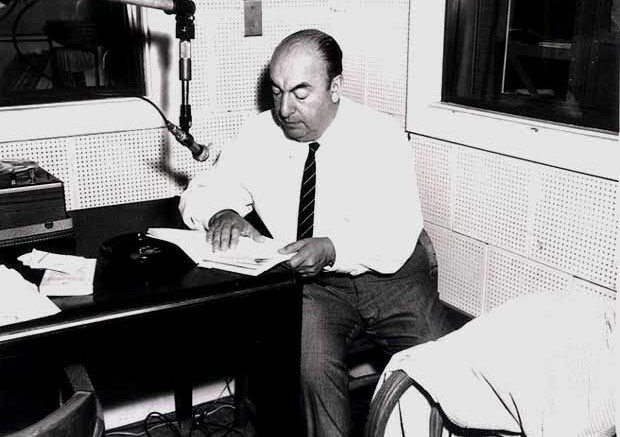 Pablo Neruda in 1966. Image via Public Domain. Pablo Neruda is one of the most, if not the most, influential figures of poetry in the twentieth century. Even from a young age, his raw passion for poetry is something rarely found, even amongst literary giants. Born Ricardo Reyes Basoalto, Neruda was raised in Temuco, Chile, after his birth mother died from illness. His father, Jose, remarried to the mother of his first child, Rodolfo. Neruda seems to have been almost completely unaffected by his birth mother’s death, though this is understandable given how little time they were able to connect. Neruda began to write at the tender age of 10. At such a formative time in his life, his father strongly opposed his poetic tendencies, but after receiving heaps of encouragement elsewhere, he went on to practice more faithfully. At only 13 years old, he published his first work in a local newspaper. After that, he spent his teenage days furiously composing poems, becoming published in dozens of local news posts and literary magazines. His pen name at the time, Neftali Reyes, quickly became recognized as a local symbol of Temuco. At the same time, however, his education continued unhindered, and Neruda soon found himself studying French at the Universidad de Chile with the prospect of becoming a teacher. Instead of dedicating his time to French, however, he found himself becoming more and more immersed in the world of poetry. With the assistance of a highly-regarded writer named Eduardo Barrios, he managed to contact and impress one of the most influential publishers in Chile at that time. His first collection of poems, “Crepusculario” (Book of Twilights), published in 1923, cemented him into the world of literary masters. Neruda didn’t spend all of his time writing poetry, however. In between creating poetry and discussing his works with other Hispanic poets, he rose to serve as one of the many diplomats Chile appointed to manage international relations and an influx of refugees from the Second World War. He quickly rose in prominence, becoming a diplomatic consul in Mexico City. His political life, however, seemed to be fated towards hardships from the beginning. After the rise of socialist support in South America and his subsequent endorsement of it, Neruda found himself facing arrest in Chile, and he strove to escape the country and secure his safety. During this three-year period, Neruda would give dozens of talks promoting peace and intellectualism in Europe and lower North America. His fame was such that while in exile, he was given honorary citizenship in Mexico. After his eventual return, it came time to designate the first democratically-elected president of Chile. While he was a candidate himself, Neruda eventually swore his support to Salvador Allende. He subsequently became one of Allende’s most trusted advisors, and only a year later he received a Nobel Peace Prize for his poetry and political work. Unfortunately, his halcyon days were not to last; the coup d’état of 1973 saw dictatorial Pinochet take the presidency and eliminate Allende. A mere twelve days later, in the midst of a battle with illness, Neruda was killed by a Pinochet agent through an injection to his stomach. Until 2015, the Chilean government had denied any knowledge of this endeavor. Nerudo, while he may be dead, continues to be remembered fondly in the hearts of poets and politicians the world over. His poetry is striking in that it is exceptionally varied. There are very few connections spanning across Neruda’s entire poetic encyclopedia, and even they are debated amongst readers. In one collection, he was inspired to use vivid imagery and copious metaphors from young and passionate relationships. In another, he speaks about his worries for the eventual decay of the human race, applying surrealism and vague language to illustrate the uncertain direction we, as a people, are headed towards. If you want to learn more than this brief glimpse into Neruda’s life has to offer, please check here. One of his many collections, “Residencia en la tierra,” is available from Amazon here.